...Journeying Up the Mountain of God: "Inherent Power"
“You will receive power when the Holy Spirit comes on you; and you will be My witnesses in Jerusalem, and in all Judea and Samaria, and to the ends of the earth.“ (Acts 1:8) When Alfred Nobel discovered an explosive element that was stronger than anything the world had known at the time, he asked a friend and Greek scholar for a word that conveyed the meaning of explosive power. The Greek word he gave him was dunamis, and Nobel named his invention "dynamite." The Greek word dunamis is the very same word that Jesus used when He told His disciples, "…You shall receive power when the Holy Spirit has come upon you" in today’s scripture text. Now many preachers have stopped right there and left the text to read, "You shall receive explosive, dynamite power when the Holy Spirit has come upon you." However, a closer examination of the Greek work dunamis is needed to ensure we understand the full meaning of this chosen Greek word. The English word “dynamite” does come from this same Greek word – but that connection is a little bit misleading. Dynamite-power is sudden, destructive and quickly over! A deeper look into the Greek meaning of the word dunamis reveals that it also means “inherent power” – this is the power that is inherent (innate) with who God is & the power which He makes available to all of us as His believers! You see, the original Greek context places the emphasis on the “power to be” rather than just the “power to do.” As I shared about two years ago with our Journey 2427 family, one of my favorite verses – and the founding verse of my evangelistic ministry, Christian Impact Ministries – is James 1:22 which declares, “be doers of the Word, not hearers only, deceiving yourselves.” (NKJV) As simple as the following observation appears, it was truly profound in my life journey – “before we do for Christ, we must first be in Christ!” For many believers who have a true servants heart to serve (“do, do, do for Christ”), we so often serve at the costly expense of simply “being in Christ” … in other words, many lose their personal time with Christ because they give it away in ministry time with others – and James 1:22 affirms that this is out of God’s Biblical order which says we must honor “being” before our “doing” for His kingdom. For some, they can misread this to justify their selfish lifestyle which is often devoid of ministry service and filled with the attitudes and actions of the world. 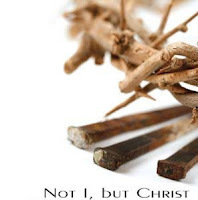 But for those whose hearts are truly bent on following Jesus, this timeless truth can change our hearts and our lives and release in and through us a “power” in our witness that is unabashedly and undeniably from the living Lord (Acts 1:8) – and that is exactly the type of witnesses which He has called us each “to be” for Him before a watching world! … Selah! Today's Spirit-led CCM video is by Phillips, Craig & Dean and can be viewed by clicking on the song title, "Crucified with Christ" - G3 for sharing His power-filled words thru CCM & Praise!